Hello. My name is Dave Stagl and I'd like to welcome you to the first post of my new column for Waves. For those who don't know me, I currently serve as the Audio Director for North Point Community Church, where I've been on staff since locating to Atlanta in 2006. My primary responsibility is to oversee audio production for our services, which includes mixing FOH, leading a team of about two dozen volunteers, staff, and contractors, and maintaining the audio systems in our two main auditoriums. In addition, I get to help out with our online broadcasts and speak into the audio post side from time to time; one of my current side projects is creating an internal audio delivery spec that incorporates the new loudness specs detailed in ATSC A/85. It is a great time to be an audio engineer, especially in a house of worship, but I haven't always worked in houses of worship. I've loved music my entire life, but I didn't really get into audio until the bug bit me in high school while working on plays, musicals and special events. In college, I split my time between performing in bands and hanging around in studios. By graduation I was working part-time doing audio editing, which segued into a diverse career spanning everything from industrial voiceovers to commercials to audio books to broadcast to making records and, of course, live sound. Ten years ago the drummer in my band finally convinced me to visit his church one weekend, and I found myself playing in the band shortly thereafter. After several months of playing, they convinced me to get involved behind the scenes, and I've been working in audio for houses of worship ever since. One of the most rewarding aspects of working in a modern house of worship is it allows me to pull from my diverse audio background. While I love many different aspects of audio production, my true passion is sitting behind a console, chasing a powerful and engaging mix. In the coming months, I hope to use this column to discuss how technology from Waves plays an integral role in my weekly workflows in nearly every situation I work in. Today I want to start by addressing one of the many challenges in mixing live sound in a house of worship: acoustic cymbals. I love acoustic drums and drummers who hit with the authority necessary to get great tone. However, cymbals are often a challenge to deal with on a live stage, especially with this prevalent 1/8th note crash/ride thing in modern worship music. Many house of worship engineers turn to drum isolation methods ranging from shields to full-on aquariums to help deal with the wash of cymbals. I, personally, have mixed feelings about drum shields. As much as I prefer the sound of a kit out in the open, sometimes the benefits to open mics on stage make it worth hauling out the old plexiglass. But sometimes even the shield isn't enough to stop an onslaught of cymbals attacking my vocal mics. I consider the SPL levels of music in our services on the lower side of concert levels, which is fortunate for us because the level of the PA can compete, and win, against the wash of cymbals pouring off the stage. This is well and good for our attendees in most seats, but vocal mics are often a different case. In a traditional concert setting, my first advice in tackling this would be to simply “do your job” as the mix engineer and learn the song, so you can ride the vocal fader(s) in and out at the appropriate times. Unfortunately, this isn't always achievable in a worship setting. Worship leaders can be a different animal than traditional vocalists and are often unpredictable on stage. Where it may be easy to learn the rhythm of a vocalist you work with night after night, worship leaders like to lead between verses and choruses at seemingly random moments where no two services are ever alike. Worship leaders also have a tendency to stand in one place, directly in front of their microphone, which makes it difficult to rely on visual cues of any sort. I have singers I've mixed for 7 years where I still can't get a satisfactory feel for when they're going to interject something, although, it's typically a safe bet it will happen the moment I pull the fader down. The cymbal challenge may also be exacerbated by the larger number of singers often found on stage in a house of worship; more open mics equals more cymbal bleed building up in the mix. And compression on the vocals to help tame vocal dynamics can turn into a bigger problem by bringing up the bleed in the mix when the compressor releases. So if you can't remove your cymbals from the stage, what are some ways to manage the cymbal challenge? Outside of a drum shield and selecting a vocal mic with good pattern control, I often turn to a bit of processing not typically associated with mixing vocals: the Gate. I know. I know. Gates have a mixed reputation; one of my first mentors absolutely despised them. But Waves has a gate function built into a few of their plugins that is actually more of a downward expander. In other words, instead of a hard on/off functionality, the gate works very smoothly and can be quite nice on vocals. It doesn't hurt that it's incredibly intuitive to set, either. I've found this particular gate in at least three of their plugins that I tend to favor for vocals: Renaissance Vox, Renaissance Channel, and MaxxVolume. My first experiences with this came while using Renaissance Vox on a vocal buss I used for parallel compression. One of the dangers of large amounts of compression in a live setting is reduced gain before feedback. Sometimes when I mixed in my compressed vocal buss, things would be great during the song, but my mics would start ringing in between when the compressor released. So I tried the gate function on a whim, since it was built into the plugin. The gate control is attached to the signal meter on the plugin, which makes setting it very intuitive. I simply set the threshold below the lowest level of my vocals in action, and above any signal that was present when they weren't singing. As soon as singing stopped, the gate essentially brought the fader down. Problem solved. A few months later I started experimenting with the Renaissance Channel as my primary vocal processor. Renaissance Channel is a great plugin because the compression curve can be toggled to the same settings as the Renaissance Vox plug-in, while adding an EQ to the equation. The gate in the Renaissance Channel also has a bit more power since a sidechain filter can be used. I use this to focus the gate to listen to the midrange of the vocals below the upper-mid and high frequency energy of the cymbals. This allows me to set the gate's threshold even higher and gain more control over reducing cymbal and stage bleed in the mics. I'm not afraid to get pretty aggressive on this, especially with background vocalists. My latest use of the gate on vocals comes courtesy of the MaxxVolume plugin. MaxxVolume has become a hidden gem in our plugin bundles. It's like the Renaissance Vox plugin on steroids, and probably warrants its own discussion for its versatility at managing dynamics. But that will have to wait for another time. Cymbals on a live stage can be a challenge to deal with, but they can be handled with a good approach and some great tools. 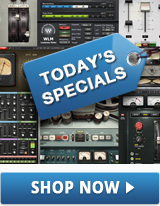 If you're struggling with cymbals and riding a fader is out of the question, I'd suggest you check out these plugins. The beauty of Waves plugins is you can demo everything they've got without even involving a dealer, and while you're experimenting, you might even find a solution to something you weren't even looking for.